Ask fellow campers about "McCreedy Campground" and nearby attractions. Our site (#24) was a gravel back-in which we chose to pull into instead due to the electric connection and the site not being level. The shared power pedestal had one 30 amp connection upside down. A table and fire grill included in the site. There was even a large load of wood left behind by an earlier camper. The owner told me he doesn't usually supply firewood. There is a dump station and fresh water available. TV was 1 channel off the antenna. Wi-Fi may be available now as that is what I am using to type this review. I would come here again if in the area. We camped at McCreedy Campground in a Motorhome. We stayed here with a caravan. Owners grouped us in a large lot with 30 amp power. We were able to dump and fill water both before and after parking here. Beware that mosquitoes and black flies can be bad at this time of year, so bring your spray. Owners were very attentive, treated us very well in addition to watching over our rigs while we were in Churchill. No wifi at campground, but able to use wifi at Tim Hortons or McDonalds in town. ATT (Rogers) phone service did work here. We camped at McCreedy Campground in a Motorhome. We stayed here in a caravan as a jumping off point for the train to Churchill to see the polar bears so I don't know how much it costs. The owners are incredibly helpful and will take care of your pets and take you to the train or airport, There may be water and sewer in the summer but in Oct we were only able to dump and fill our tanks before or after leaving sites. It's near the Burntwood River so in the summer, it's probably a good spot. 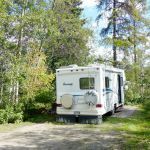 Just wanted to alert RVers that there was a CG in Thompson besides the provincial park. Admin note: No sewer at site and only 2 water hookups. Open May-Oct. We camped at McCreedy Campground in a Motorhome. Are you affiliated with McCreedy Campground ?